Teaching anglers how to cast a fly rod and cast it well is something our Montana fly fishing guides do on a daily basis. Sometimes we work with seasoned anglers to polish up their stroke but many times we are starting from scratch and teach novice anglers who have never picked up a fly rod the basics. From our experience teaching hundreds of anglers the fundamentals of the cast, we have found a way to break it up into 3 basic steps. 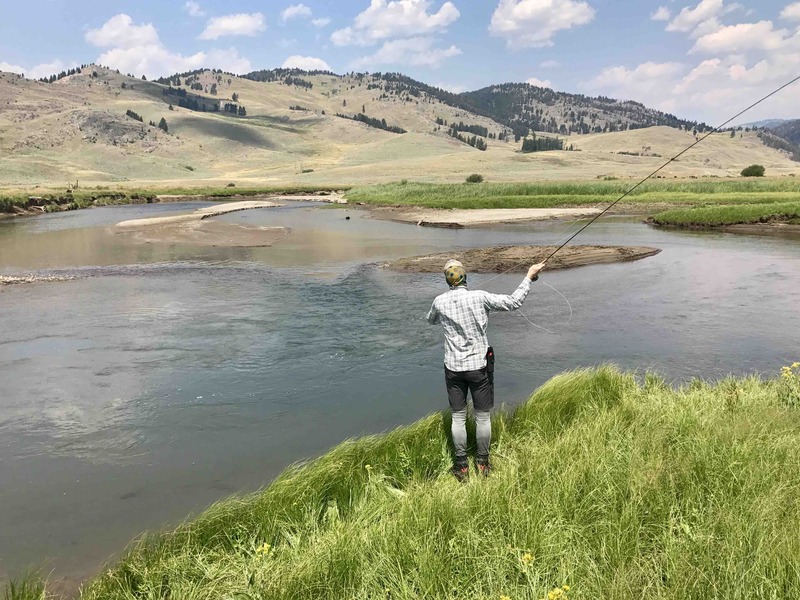 These steps are geared primarily toward casting a fly rod with a single dry fly, out of a drift boat, for wild Montana trout as we do so often, but is applicable across the whole wide world of fly fishing. This is the core of the fly fishing cast. Forget 10 and 2 and leave our metronome at home. While all of that works well in the movies, modern fast action rods don’t respond as well to the slower and wider casting stroke of yesteryear. 90% of all fly casts during a day of fishing are the “pick up and lay day cast” where an angler already has line out and simply needs to recast, reposition the fly, or possibly shorten or lengthen their line. So this is the cast we are most concerned with. The first step to mastering this cast is to always start your cast with the rod tip low (in the water), pause on your backcast with the rod tip high (closer to 12 than 2), and finish with your rod tip low (in the water). The result is a downward trajectory to your cast that will ultimately result in a fly-first presentation where your fly lands prior to your line. This allows for better mending, hooksets, and accuracy. The fly cast works when energy is directly transferred from your body, through your fly line and rod, and to your fly. In order to accomplish this, your fly line has to remain tight and connected to each other part throughout your casting stroke. The fly cast is all about efficient use of energy. Simply put slack line in your cast kills energy and kills your cast. Starting your cast with loose line on the water is akin to starting off behind the 8-ball. You are setting yourself up to fail. Defeat slack in all parts of your cast. Make sure your line is taught before you attempt to pick up your line. Pinch the line under the index finger of the hand you hold the rod with and pull it in. Make sure the rod tip is low and line is tight before you start your cast. The fly cast should be thought of two separate casts: a back cast followed by a forward cast. It isn’t one continuous motion but rather two separate casts with a distinct pause in between. This pause should occur at the apex of the back cast and is what gives your fly line a chance to roll-out and remove slack in your back cast. If you do not wait long enough and you start your forward cast before your back cast you will just be beating air, your line will not go back forward. Defeat slack in your line and pause at the top of your cast. Combine this with starting low, pausing high, and finishing low and you will be well on your way to great casting. Keep your elbow glued to your hip and cast with your arm and shoulder, not your wrist. It is common to see new fly anglers that have previous spin fishing experience to try to cast with just their wrist. If you follow the previous two steps and use your wrist you will get passable results. But you will tire out, quickly, trust me. Some wrist casters may make it a whole day but most won’t make it to lunch with out complaining about tired hands and wrists. The fly cast is a dynamic and powerful motion. Your wrist muscles are too small to handle all of the force. To fix this, glue your casting elbow to your hip, keep your wrist totally stiff, and pivot around your elbow with your arm and shoulder when you cast. Using these larger muscle groups will quickly translate to more power, better distance control, and longer days on the water with less fatigue. The fly cast isn’t a super human feat of strength but rather a deliberate stroke that requires commitment to each step along the way and efficient use of your body and fly rod. If you ever feel like you have to muscle the fly out, stop, you are doing too much. Reset, go back to the basics, and think about stopping sooner, waiting longer and casting with your shoulder, not with your wrist. This will save you a lot of frustration and sore muscles.